Love it or hate it, you’ve gotta admit the Designated Hitter Rule has created a tremendous amount of thunder and lightning in American League and inter-league games played in AL stadiums. Since MLB’s American League voted to allow its teams to use a “designated pinch hitter” in place of the pitcher starting in 1973, the practice has 1) boosted the excitement of games and 2) added years to the careers of veteran players who could still strike fear into the hearts of opposing pitchers, but found it difficult to play a defensive position. Arguably the greatest designated hitter of all time was two-time League MVP and longtime Chicago White Sox Frank Thomas. 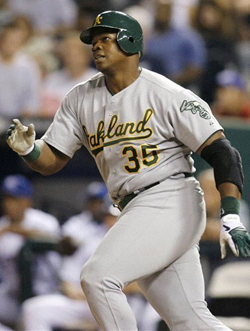 Known as “The Big Hurt” for his enormous size and the hurtin’ he could put on a baseball, Thomas hit his 244th home run as a DH on June 17, 2007, while playing north of the border as a member of the Toronto Blue Jays. Big Frank eventually set the all-time DH dinger mark of 253 dingers after returning to his first team The Oakland A’s. Replacing Thomas as DH on Chicago’s south side was another large guy, “Big Jim” Thome. And to prove that US Cellular Field was a perfect breeding ground for DH sluggers, Thome proceeded to hit 159 homers as a designated hitter with The White Sox to take second spot on the 500HRC list of DH power hitters. Rafael Palmeiro pounded out 107 homers as a designated hitter, including most of his four-baggers after 1999. “Mr. October” Reggie Jackson was the prototypical DH, anchoring the middle part of the batting order for Championship teams from both coasts for 15 seasons (1973-87). Reggie hit 101 of his 563 home runs as a designated hitter, which was the most by any of the members of the 500 Home Run Club for many years before Palmeiro, Thome and Thomas raised the bar. Eddie Murray hit the first 12 homers of his career in 1977 as a designated hitter and most of his blasts towards the end of his career at that position. Alex Rodriguez, who hit #500 on August 4, 2007, has only smacked 10 blasts as a DH. • Ron Blomberg became the first DH in major league history when on April 6, 1973 at Fenway Park, he was walked by Red Sox pitcher Luis Tiant in his first plate appearance of the game. • Tony Oliva became the first DH to hit a home run playing for the Minnesota Twins on April 6, 1973.